John Griffith Chaney—or, to use the name by which he was known after his mother’s marriage, Jack London—is primarily remembered as the author of adventure tales set in the Klondike (Call of the Wild, “To Build a Fire”) and of proletarian fiction (Martin Eden, The Iron Heel). 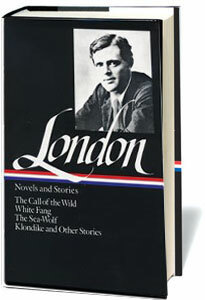 But the nearly two hundred stories he published during his lifetime are impossible to pigeonhole into such tidy categories; London often blended genres from naturalism to science fiction to create unprecedented hybrids for an international readership. He was a young man, not more than twenty-four or five, and he might have sat his horse with the careless grace of his youth had he not been so catlike and tense. His black eyes roved everywhere, catching the movements of twigs and branches where small birds hopped, questing ever onward through the changing vistas of trees and brush, and returning always to the clumps of undergrowth on either side. . . . If you don't see the full selection below, click here (PDF) or click here (Google Docs) to read it—free! This story reads like two stories thumbtacked together. Since London was so prolific, is that possible?